"This is a great, quick, and easy apple crisp with no cleanup. The apples are soft with a little crispness and mix great with the crumble topping. You can serve this to any of your family and friends!" Combine butter and white sugar in a bowl using your fingers. Add flour, oats, 3 dashes cinnamon, and salt; mix until crumbly. Grease a mug; flatten 1/2 the crumble mixture into the bottom to form a crust. Microwave crust for 30 seconds on high. 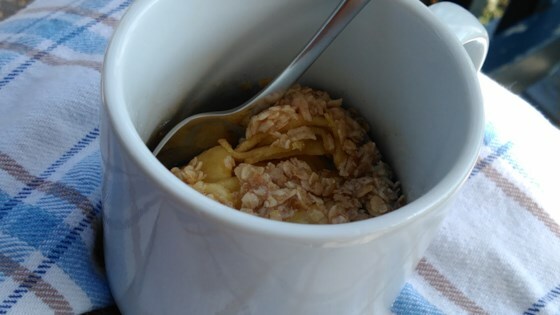 Remove mug from microwave; add 1 dash cinnamon, apple slices, and brown sugar. Add water. Mix apples, brown sugar, and cinnamon together carefully without disturbing crust. Pour remaining crumble mixture on top. Microwave for 1 minute and 50 seconds on 60% power. Remove from microwave; let cool about 1 minute. If you like a tart apple crisp, then you can use less sugar. The amount you take out is up to you based on how sweet you like it. You may want to give the original recipe a try before messing with how much sugar you put in. A great breakfast I made with fresh Honey Crisp apples! Of course I had to make 2 since it called for 1/2 an apple. I didn’t have an apple so used a peach with a dash of nutmeg - delish and so fast! Thanks for sharing! I made the recipe as written but only 3/4 of the recipe. I put it in a flat bottomed bowl for ease of eating. I topped it with vanilla yogurt. It was delicious!